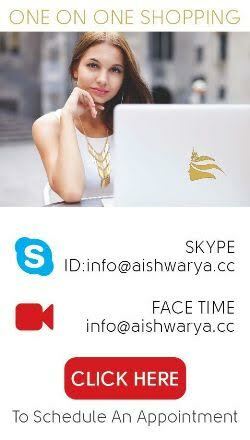 AISHWARYA collects client information to make your online shopping experience the very best on the Internet. We respect your privacy, and we assure you that we will maintain and use this information responsibly. Keeping in mind the very basic nature of every AISHWARYA outfit, our customers do appreciate that each outfit ordered online is individually created, crafted and made to fit perfectly in accordance to the measurements provided. Relatively, fashion is an evolution. Due to the dynamism of this evolution, we respect the customers’ ability to support AISHWARYA’s “No Refund No Exchange” policy to help us deliver the very best and latest in Indian fashion. However in order to provide our valuable customers full service, we have relaxed our exchange policy a little bit. We will exchange a product only if we have sent you a completely different product from the one that you ordered. We will pay for the shipping charges in this case. Please note that the shipping charges will be reimbursed to you in the form of discount and/or Online store credit which you can utilize in your future online orders with us. We can not send refunds for the shipping charges in any cases. If we ship out a product in the wrong size than the one that is specified in your order then we will exchange it for your correct size. We will pay for shipping charges both ways. Please note that the shipping charges will be reimbursed to you in the form of discount and/or Online store credit which you can utilize in your future online orders with us. We can not send refunds for the shipping charges in any cases. However if it is the same product that you ordered and if you ordered the wrong size then we will still exchange the size for you. But in this case you will have to pay for shipping both ways that is shipping it to us and also return shipping. AISHWARYA firmly believes that all the customers who order online are aware that colors seen on a monitor will be slightly different as compared to the actual outfits. All color options offered on the net is an exercise to provide our customers with the maximum available choice of AISHWARYA outfits. It is practically impossible for us to replicate the same colors on an outfit as seen on your monitor. A slight variation in the shade selected by you is considered as a normal practice as these garments have a tendency to reflect different shades of a color under different light and medium. The customers must be aware that each and every product that we sell at AISHWARYA is hand made/crafted in the finest traditions of India's textile crafts. Some of the irregularities in the embroidery, print or work are characteristics of the hand-made process and beyond our control. For every item that is sold from AISHWARYA, we do proper finishing before dispatching the item and we pack the items with utmost care. However during the shipping and handling, there might be some minor damages (such as missing stones, loose buttas, etc) which are out of our control. All credit card payments must be authorized online. In the event of non-authorization of any credit card, AISHWARYA is not responsible for all or part failure of non-acceptance and non-authorization of such credit cards. All transactions are subject to Mumbai jurisdiction only. Our effort will be to meet your expectations constantly and thus avoid any misunderstanding or discrepancies through our online venture. AISHWARYA trusts and has faith in its customers for making its online venture successful so that every year AISHWARYA can deliver and probably exceed customer expectations and beyond.